Population-based studies of pulmonary nontuberculous mycobacterial disease in the USA indicate increasing prevalence. Prevalence is higher among women, older populations, and persons of Asian ancestry. The most frequent species is Mycobacterium avium complex, although the proportion varies geographically, with high rates of Mycobacterium abscessus in areas including the Southeast. Both host and environmental factors modulate disease risk. Environmental risk factors include high vapor pressure and low soil pH, while host risk factors include structural lung disease, thoracic skeletal abnormalities, and immunomodulatory medications. This research was supported by the Intramural Research Program of the NIAID, NIH. Parte AC. LPSN – list of prokaryotic names with standing in nomenclature. Nucleic Acids Res. 2014;42(Database issue):D613–6. https://doi.org/10.1513/AnnalsATS.201610-802PS. 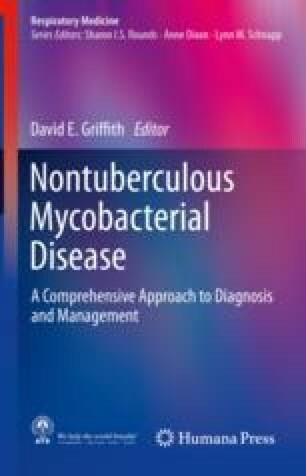 Winthrop KL, Henkle E, Walker A, Cassidy M, Hedberg K, Schafer S. On the Reportability of nontuberculous mycobacterial disease to public health authorities. Ann Am Thorac Soc. 2016;14(3):314–7. https://doi.org/10.1513/AnnalsATS.201610-802PS. Adjemian J, Frankland TB, Daida YG, Honda JR, Oliver KN, Zelazny A, Honda S, Prevots DR. Epidemiology of nontuberculous mycobacterial lung disease and tuberculosis, Hawaii, USA. Emerg Infect Dis. 2017;23(3):439–47. https://doi.org/10.3201/eid2303.161827. Smith GS, Ghio AJ, Stout JE, Messier KP, Hudgens EE, Murphy MS, Pfaller SL, Maillard JM, Hilborn ED. Epidemiology of nontuberculous mycobacteria isolations among central North Carolina residents, 2006-2010. J Infect. 2016;72(6):678–86. https://doi.org/10.1016/j.jinf.2016.03.008. Henkle E, Hedberg K, Schafer SD, Winthrop KL. Surveillance of extrapulmonary nontuberculous mycobacteria infections, Oregon, USA, 2007-2012. Emerg Infect Dis. 2017;23(10):1627–30. https://doi.org/10.3201/eid2310.170845. Donohue MJ, Wymer L. Increasing prevalence rate of nontuberculous mycobacteria infections in five states, 2008-2013. Ann Am Thorac Soc. 2016;13(12):2143–50. https://doi.org/10.1513/AnnalsATS.201605-353OC. Vinnard C, Longworth S, Mezochow A, Patrawalla A, Kreiswirth BN, Hamilton K. Deaths related to nontuberculous mycobacterial infections in the United States, 1999-2014. Ann Am Thorac Soc. 2016;13(11):1951–5. https://doi.org/10.1513/AnnalsATS.201606-474BC. Novosad SA, Henkle E, Schafer S, Hedberg K, Ku J, Siegel SA, Choi D, Slatore CG, Winthrop KL. Mortality after respiratory isolation of nontuberculous mycobacteria: a comparison of patients who did and did not meet disease criteria. Ann Am Thorac Soc. 2017;14(7):1112–9. https://doi.org/10.1513/AnnalsATS.201610-800OC. Dirac MA, Horan KL, Doody DR, Meschke JS, Park DR, Jackson LA, Weiss NS, Winthrop KL, Cangelosi GA. Environment or host? : a casecontrol study of risk factors for Mycobacterium avium complex lung disease. Am J Respir Crit Care Med. 2012;186(7):684–91. https://doi.org/10.1164/rccm.201205-0825OC. Maekawa K, Ito Y, Hirai T, Kubo T, Imai S, Tatsumi S, Fujita K, Takakura S, Niimi A, Iinuma Y, Ichiyama S, Togashi K, Mishima M. Environmental risk factors for pulmonary Mycobacterium avium-intracellulare complex disease. Chest. 2011;140(3):723–9. https://doi.org/10.1378/chest.10-2315. Lipner EM, Knox D, French J, Rudman J, Strong M, Crooks JL. A geospatial epidemiologic analysis of nontuberculous mycobacterial infection: an ecological study in Colorado. Ann Am Thorac Soc. 2017;14(10):1523–32. https://doi.org/10.1513/AnnalsATS.201701-081OC. Lande L, Peterson DD, Gogoi R, Daum G, Stampler K, Kwait R, Yankowski C, Hauler K, Danley J, Sawicki K, Sawicki J. Association between pulmonary Mycobacterium avium complex infection and lung cancer. J Thorac Oncol. 2012;7(9):1345–51. https://doi.org/10.1097/JTO.0b013e31825abd49. Kirschner RA Jr, Parker BC, Falkinham JO III. Epidemiology of infection by nontuberculous mycobacteria. Mycobacterium avium, Mycobacterium intracellulare, and Mycobacterium scrofulaceum in acid, brown-water swamps of the southeastern United States and their association with environmental variables. Am Rev Respir Dis. 1992;145(2 Pt 1):271–5. https://doi.org/10.1164/ajrccm/145.2_Pt_1.271. Spaulding AB, Lai YL, Zelazny AM, Olivier KN, Kadri SS, Prevots DR, Adjemian J. Geographic distribution of nontuberculous mycobacterial species identified among clinical isolates in the United States, 2009-2013. Ann Am Thorac Soc. 2017;14(11):1655–61. https://doi.org/10.1513/AnnalsATS.201611-860OC. De Groote MA, Pace NR, Fulton K, Falkinham JO 3rd. Relationships between Mycobacterium isolates from patients with pulmonary mycobacterial infection and potting soils. Appl Environ Microbiol. 2006;72(12):7602–6. https://doi.org/10.1128/aem.00930-06. Fujita K, Ito Y, Hirai T, Maekawa K, Imai S, Tatsumi S, Niimi A, Iinuma Y, Ichiyama S, Mishima M. Genetic relatedness of Mycobacterium avium-intracellulare complex isolates from patients with pulmonary MAC disease and their residential soils. Clinical microbiology and infection: the official publication of the European society of. Clin Microbiol Infect Dis. 2013;19(6):537–41. https://doi.org/10.1111/j.1469-0691.2012.03929.x. Bryant JM, Grogono DM, Greaves D, Foweraker J, Roddick I, Inns T, Reacher M, Haworth CS, Curran MD, Harris SR, Peacock SJ, Parkhill J, Floto RA. Whole-genome sequencing to identify transmission of Mycobacterium abscessus between patients with cystic fibrosis: a retrospective cohort study. Lancet. 2013;381(9877):1551–60. https://doi.org/10.1016/s0140-6736(13)60632-7. Tettelin H, Davidson RM, Agrawal S, Aitken ML, Shallom S, Hasan NA, Strong M, de Moura VC, De Groote MA, Duarte RS, Hine E, Parankush S, Su Q, Daugherty SC, Fraser CM, Brown-Elliott BA, Wallace RJ Jr, Holland SM, Sampaio EP, Olivier KN, Jackson M, Zelazny AM. High-level relatedness among Mycobacterium abscessus subsp. massiliense strains from widely separated outbreaks. Emerg Infect Dis. 2014;20(3):364–71. https://doi.org/10.3201/eid2003.131106. Malcolm KC, Caceres SM, Honda JR, Davidson RM, Epperson LE, Strong M, Chan ED, Nick JA. Mycobacterium abscessus displays fitness for fomite transmission. Appl Environ Microbiol. 2017. https://doi.org/10.1128/aem.00562-17.